When two parallel lines are “cut” by a transversal, some special properties arise. We will begin by stating these properties, and then we can use these properties to solve some problems. 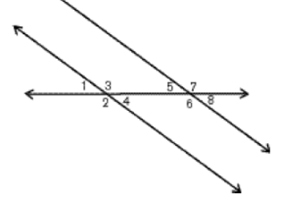 PROPERTY 1: When two parallel lines are cut by a transversal, then corresponding angles are congruent. 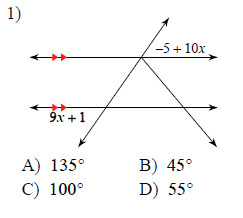 In the diagram below, angles 1 and 5 are corresponding, and so they are equal. Similarly with angles 4 and 8, etc. 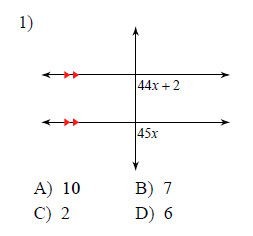 PROPERTY 2: When two parallel lines are cut by a transversal, then adjacent angles are supplementary. That is, when two parallel lines are cut by a transversal, then the sum of adjacent angles is \(180^\circ \). In the diagram above, this property tells us that angles 1 and 2 sum to \(180^\circ \). Similarly with angles 5 and 6. 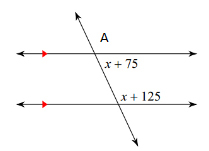 But from property 1, we know that \(A = x + 125\), since those two angles are corresponding. Then \(x + 75 + x + 125 = 180\), so that \(2x + 200 = 180\). Then \(2x = - 20\), and \(x = - 10\). 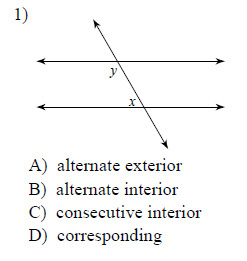 Identify each pair of angles as corresponding, alternate interior, alternate exterior, or consecutive interior. Find the measure of the angle indicated in bold.